Not all seems to be well with the Trumps if US-based poll numbers are to be believed. Over a third of Americans think that the United States' first lady Melania Trump should "leave" President Donald Trump, following reports of an alleged affair with adult star Stormy Daniels, the Newsweek reported. 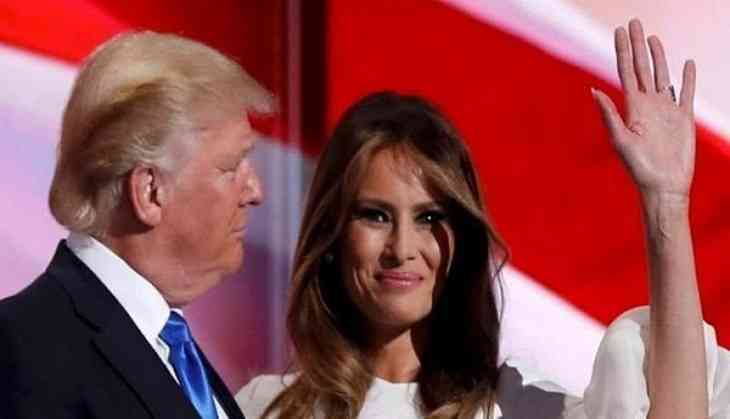 According to the Marist poll, a US public opinion poll, which was published on Wednesday, 34 percent of Americans felt that Melania should end her 13-year marriage with President Trump. However, 43 percent of Americans felt that the US first family should not end their marriage and stay together. 23 percent of Americans were unsure of Melania's next course of action. The Marist poll revealed some interesting observations about Americans' opinion on the alleged presidential infidelity. Gender-wise, 49 percent of men thought Melania should stay with President Trump. Women, however, were divided- 38 percent felt that Melania should leave her husband, while 36 percent felt she should stay. Another 26 percent said that they were unsure. Respondents aged over 45 supported the US' first couple to stay together. People aged 45 years also felt that Melania should stay with President Trump. However, 41 percent of those under the age of 45 felt that Melania had to leave her husband. Meanwhile, in the political sphere, 71 percent from the Republican Party, to which President Trump belongs, felt that the Trumps should stay together. However, 50 percent from the Democratic Party thought that Melania should leave her husband. Amid the reports, Melania arrived at the Marine One air base in Washington D.C, opting to drive separately without President Trump. She also skipped the traditional South Lawn couple walk in the White House. "With her schedule, it was easier to meet him on the plane," Stephanie Grisham, the first lady's communications director, said in a statement. Melania does plan to accompany her husband when he visits with victims of the mass shooting in Parkland in Florida, a White House official told CNN. President Trump paid around USD 130,000 out of his own pocket to Daniels, who claimed to have had an affair with the US President, his personal lawyer Michael Cohen told the New York Times. Cohen, who previously served as an attorney for the Trump Organisation and is now Trump's personal lawyer, defended the payment to the newspaper. He, however, declined to discuss the payment further, including whether President Trump knew of it or the motivation behind it. Last month, the Wall Street Journal (WSJ) reported that Cohen arranged USD 130,000 for Daniels as part of a nondisclosure agreement, one month before the 2016 presidential elections. Trump's lawyer had "vehemently" denied the WSJ's report. In 2011, Daniels said in an 'In Touch Magazine' interview with that she had a sexual encounter with Trump at Lake Tahoe in 2006, just one year after the US President had married now-first lady Melania Trump. Melania had given birth to his son, Barron, four months before the alleged sexual encounter took place. During an appearance on the "Jimmy Kimmel Live!" show last month, Daniels denied having an affair with Trump saying, "I do not know where it came from." Melania Trump was reportedly "blindsided" by the reports of the payoff and was "furious" with the US President, two people close to the first couple told The New York Times.